Take your riding to the next level, no matter where you are currently! Clinics are designed for individuals/small groups to proceed at their own ability and skills level, tailored to specific needs, desires, and learning styles, from the very young to the still young at heart. Clinics could be one-on-one or for small groups up to 4 people. Perfect for riders to progress at their own rate and work on the skills most needed for riding with improved technique and confidence. 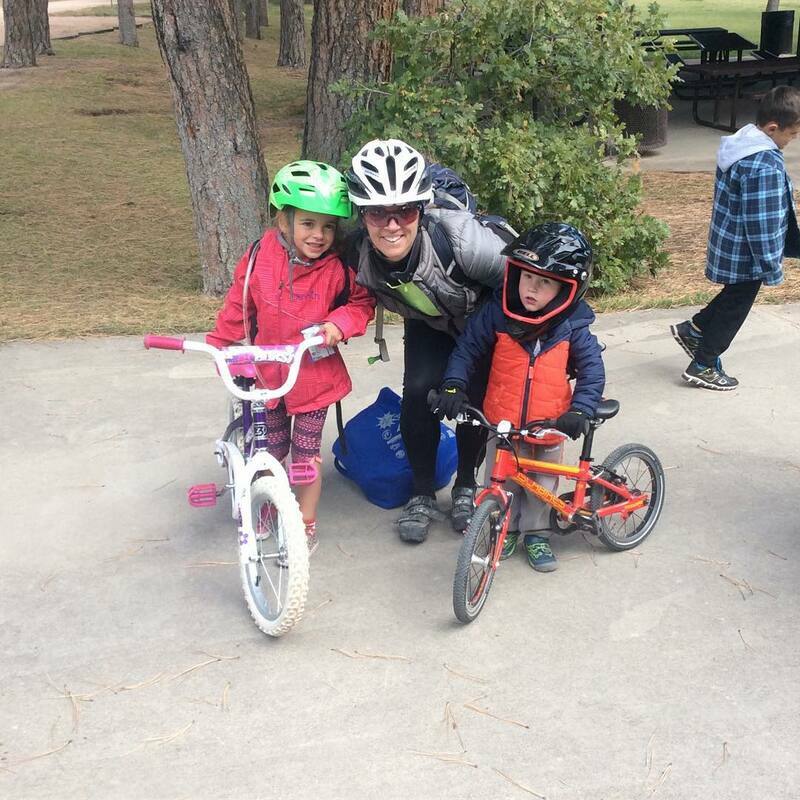 WEE ONES - It's never too early to start developing good skills on a bike! 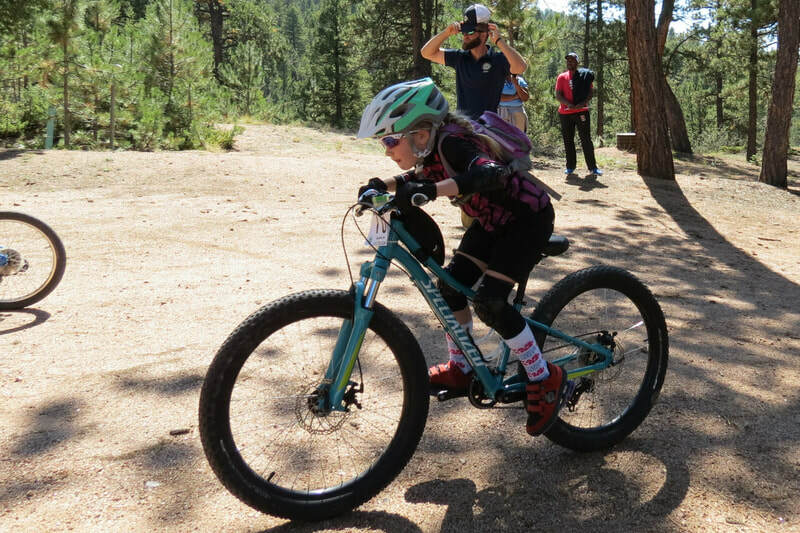 KIDS - Get the young ones started on the right foot with a skills clinic tailored to their smaller bike and person size. TEENS - Keep your adolescent safe when entering a new sport, wanting to get started or push their skills in racing. FAMILY - All can improve their techniques together in a fun, supportive environment. 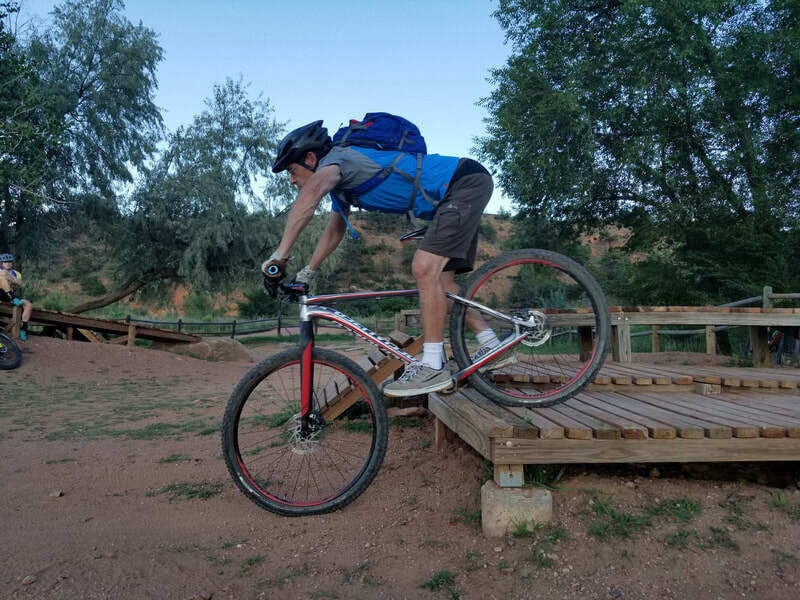 MEN – Push through that plateau to hone your technique and reach the next level of riding ability. WOMEN – Overcome fear and develop confidence in a not-threatening environment. Perfect for women new to riding and not yet comfortable! 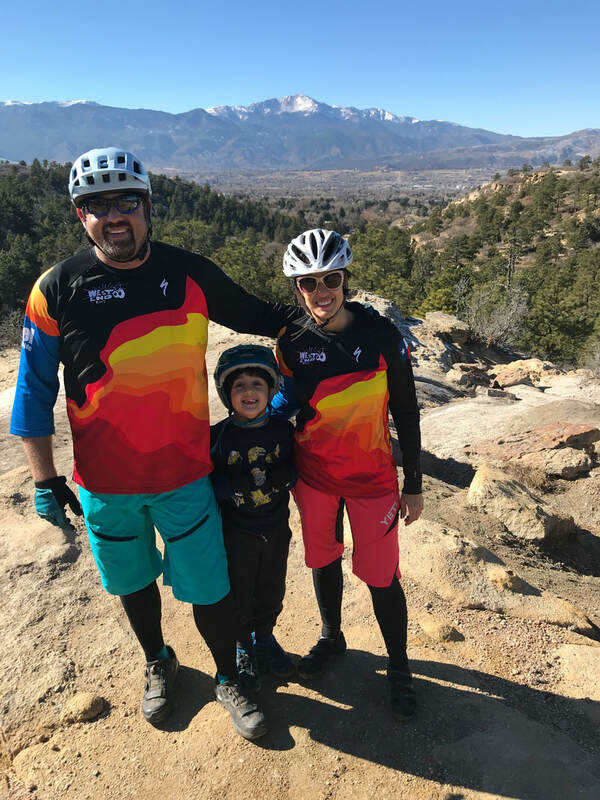 COUPLES - Therapy on a mountain bike teaches partners to embrace another’s style of riding while learning to better communicate and support each other on rides. YOUNG AT HEART – You’re never too old to improve your skills! 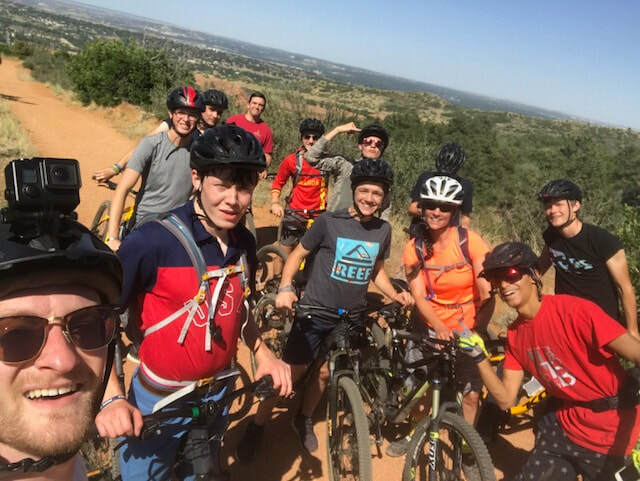 Mountain biking is guaranteed to keep you as young as you feel! Click the plus sign (+) for information, pictures and videos of each skill type! If you’ve never been on a bike before, that’s OK! Everyone has to start somewhere! 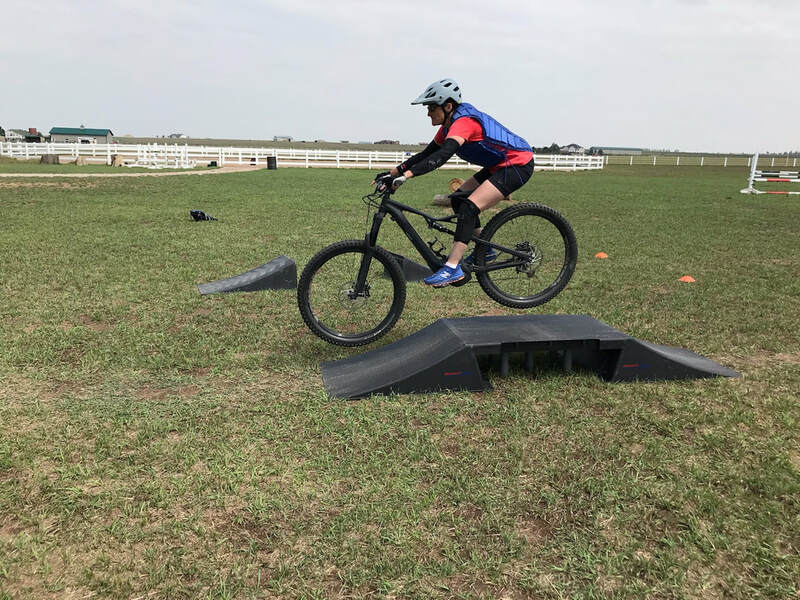 This progression teaches how to get on the bike, where to put your feet on the pedals, what the gears do and how to shift, using other bike components correctly, where to look and ride, how to safely stop and dismount on various terrain. 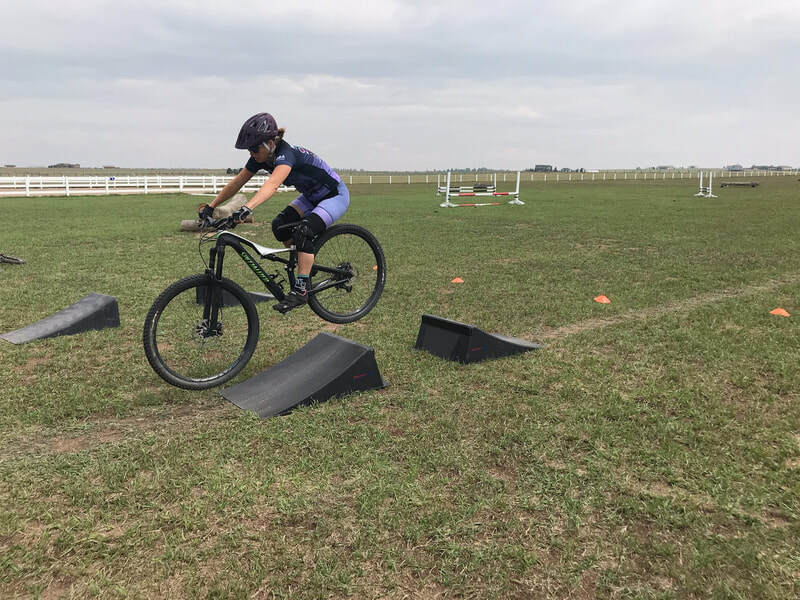 ​This progression reviews the skills required for all levels of riders to improve their technique! Includes body position and weight distribution on the bike, high vs. low ready positions, 3 types of body-bike separation, how brakes work and techniques for braking, introduction to cornering and turns. You will get faster during this progression, as races are won by those who corner well. 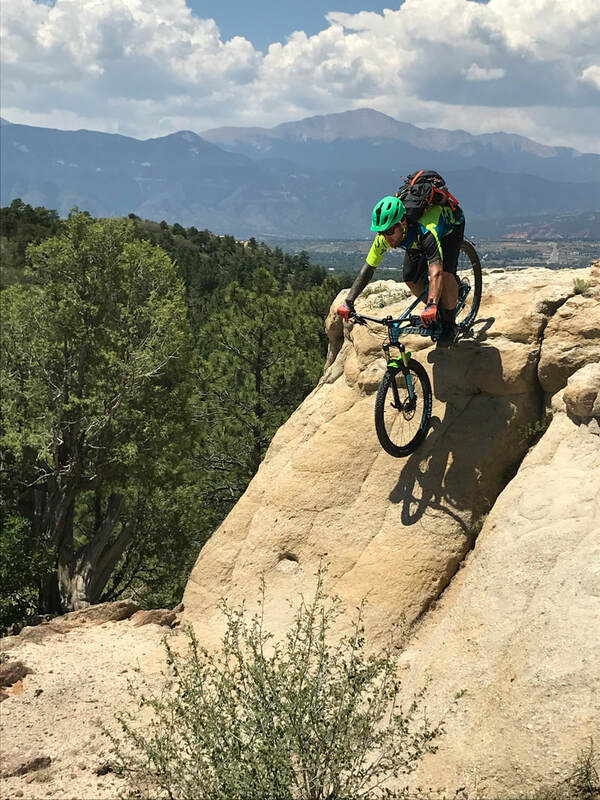 Learn different tricks for different terrain, and how to pick up speed instead of loose it during cornering. High-speed cornering techniques will be introduced in this progression. 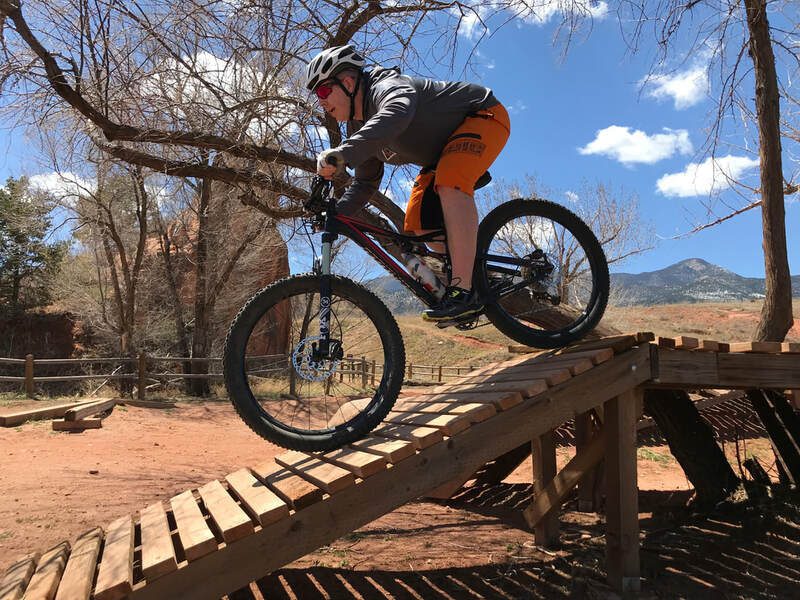 Tips for how to ride various types of obstacles, including beams and skinnies, ramps of various steepness up and down, log rolls, and small rock gardens. Hone your technique on smaller obstacles before moving on to the bigger and badder stuff, which you will now ride with more finesse after this progression. This new technique for riding drops and steep transitions will change your life! 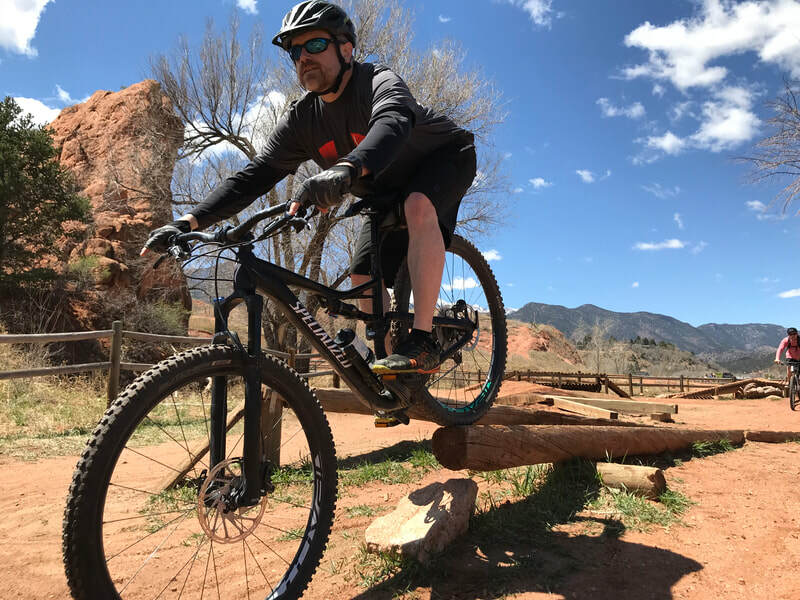 ​Learn to get those wheels off the ground to begin flying on the bike instead of off of it! Progression includes where to compress the bike for front wheel lifts, rear wheel lifts, and both wheel lifts. Includes tricks for making manuals easier to conquer, as well as an introduction to various types of bunny hops. Wheels Off the Ground required prior to jumping. 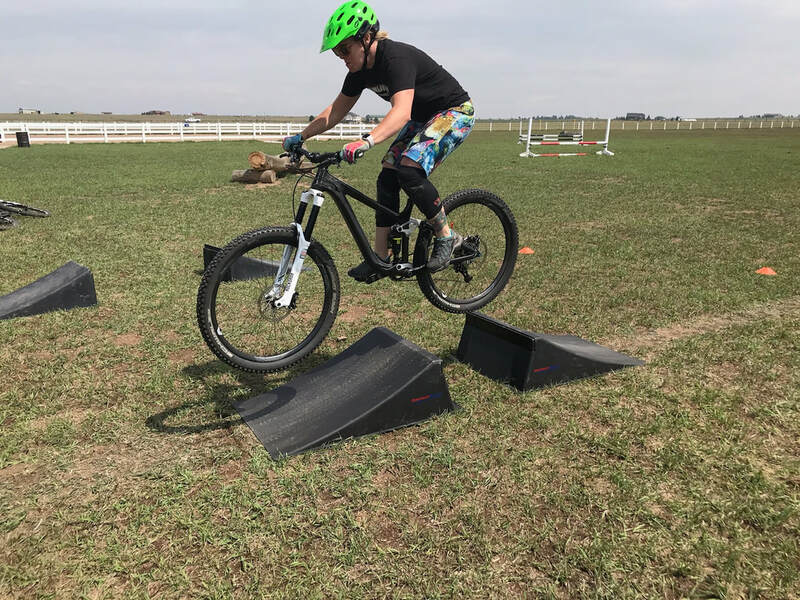 Using ramps specifically designed for this type of progression, riders will learn how to take off, arc, and land a jump. Then, the tabletop between ramps will be removed to introduce gap jumps. As rider technique improves, the gap widens – as do the smiles on the races of the jumpers! More advanced sessions can be scheduled on an individual basis or at the conclusion of the above progression. Stacy is an excellent teacher and guide in the Colorado Springs Area. 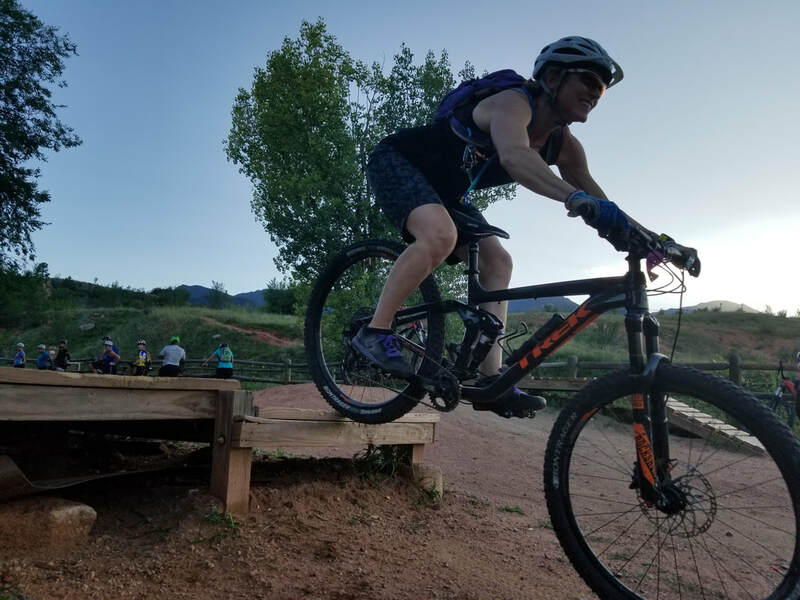 I’ve been riding mountain bikes for over twenty years and in the skills clinic she taught me many techniques that made me a better rider. She is enthusiastic and encouraging. 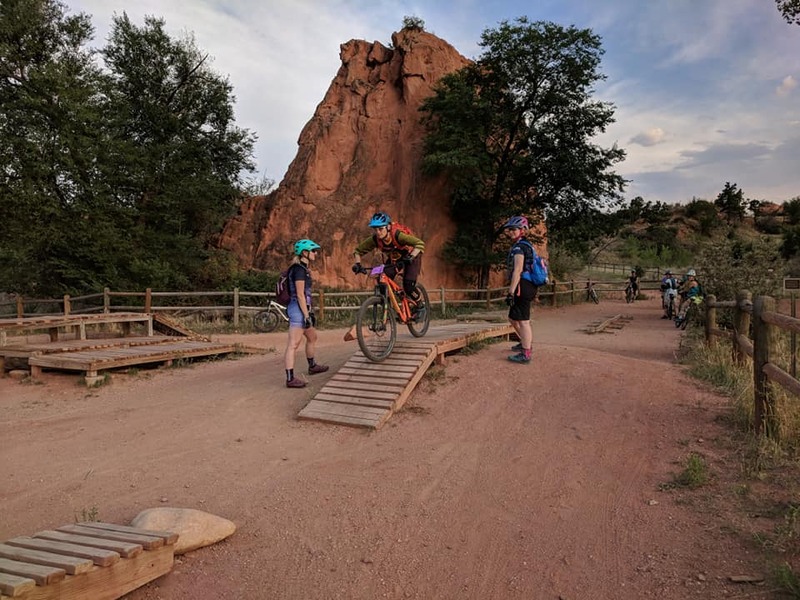 Don’t pass up the opportunity to improve your skills or take a tour of the best trails in Colorado Springs. Fantastic instructor! I learned so much and enjoyed every experience. Stacy is awesome to work with and extremely knowledgeable. I just wish she lived in VA! I’m a better mountain bike rider because of her instructions and I feel like I’ve made a friend for life. I’m a beginner rider and my husband is an intermediate to advanced rider and we both learned a lot and had a great time learning with her. 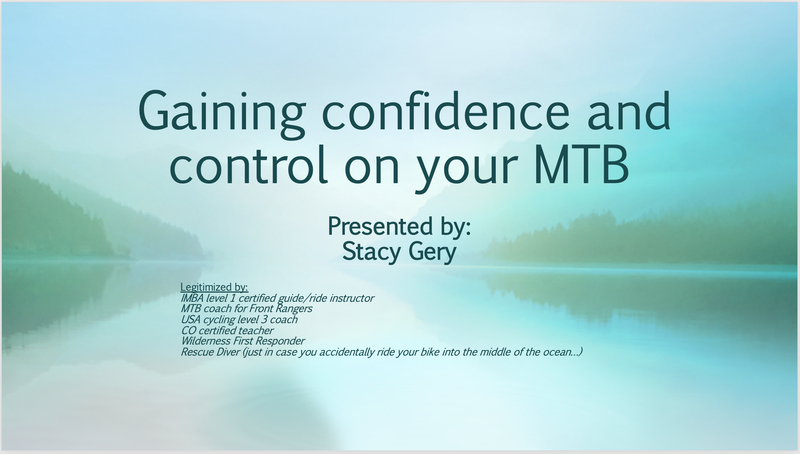 If you are looking for a mountain bike instructor, Stacy (& team) is great! I've learned a ton in the clinics and I love her enthusiasm, her encouragement, and how she pushes me to do my best! 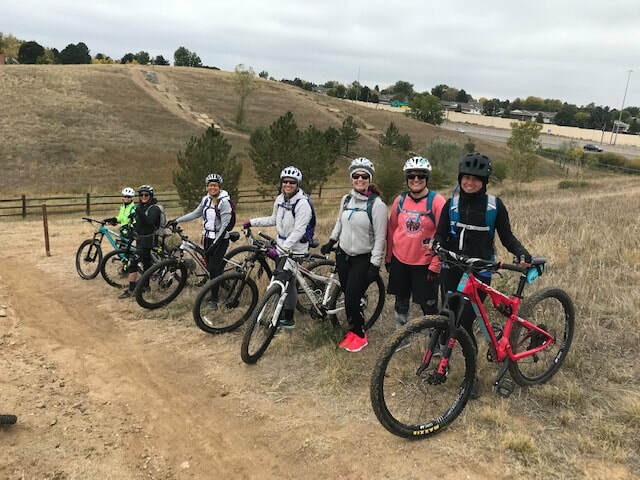 I am so grateful to have found her through the Women's Mountain Biking Association. 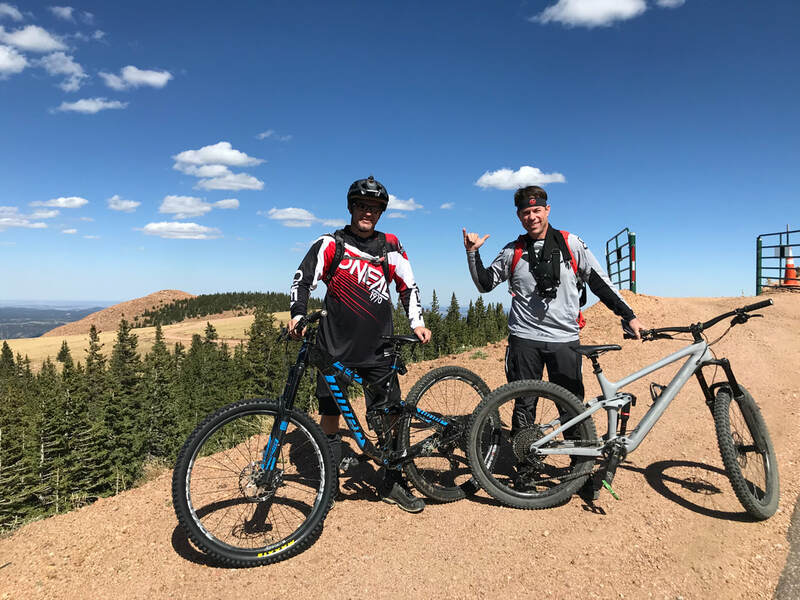 I’ve been riding bikes all my life and thought mountain biking would be easy to learn - boy was I wrong! With many crashes, I was about ready to sell my bike. I wasn’t enjoying it because I didn’t have control. I decided to take a fundamental skills class with Stacy. I can’t believe how much all my fears have subsided, especially going downhill. Stacy is a phenomenal teacher and knows how to make it fun at the same time! If you’re looking to build your confidence, Stacy will help you achieve that. 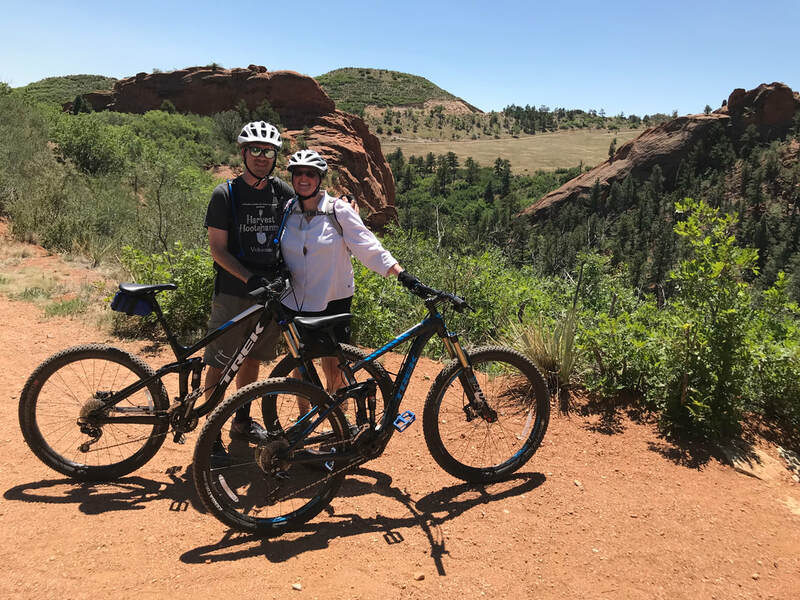 Stacy has really helped me tons with mountain bike skills! She's got a knack for knowing what I need to work on and picks the best trails for those skills. 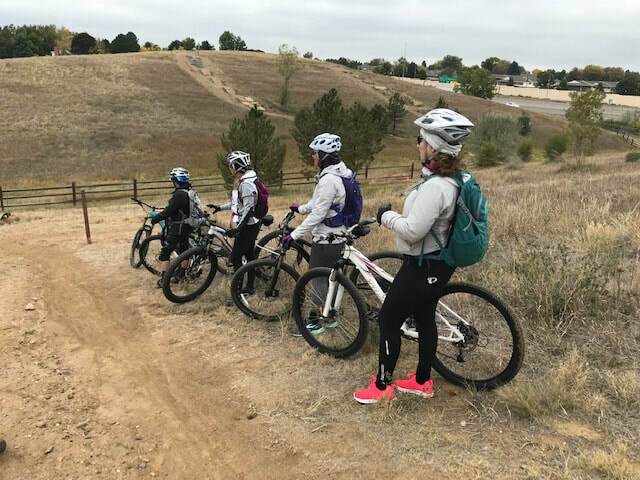 Sessions are a great way to experience new skills and trails. What's important to me is she is very patient and encouraging. Instructions are very clear and helpful and she never gets frustrated no matter how many times I need to practice it. I wouldn't be where I am without her taking me out on the trails and I don't hesitate to recommend her. Stacy is just an amazing teacher, motivator and fun person to learn and spend time with. My husband and I had our first private session with her yesterday and never in my wildest dream that I thought I would accomplish sooo much in 2.5 hrs, but that is how gifted this girl is in teaching skills. Grateful beyond words.